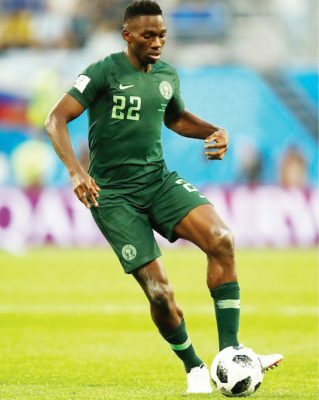 Leganes of Spain defender, Kenneth Omeruo has declared that he and his colleagues in the Super Eagles can win the 2019 Africa Cup of Nations in Egypt, because he believes they have a good squad. Omeruo is banking on the Eagles’ youthful qualities and tactical depth to see them through, but admits they also have to be well prepared for the continental soccer showpiece in June. With the Nigerian team having qualified for Egypt 2019 already, with a game to spare, Omeruo and his Eagles’ colleagues are set for a formality last match in the qualifiers against Seychelles on March 23 in Asaba. Beyond that, the dark-skinned stopper, who is on loan from Chelsea of England at Leganes, also acknowledged the need for the players to stay focused on the mission ahead of them, for which he says they need to be very serious and take each game one at a time. The vastly-improved central defender, who was also part of Nigeria’s third AFCON conquest, at South Africa 2013, lamented that the Eagles could not qualify for the past two editions of the competition, but says that is another reason why they will go all for glory in Egypt. Meanwhile, Eagles assistant captain, Ahmed Musa will be available for next month’s Africa Cup of Nations qualifier against Seychelles and international friendly with Egypt. The Al-Nassr winger has not featured for the Saudi Arabian Professional Football League team since January 3 due to a serious thigh injury, which raised doubts over his participation in the national team’s matches. The latest update from Al-Nassr is that Musa has resumed full training with the German preparing his squad list for the first two fixtures of 2019. About a month ago, the former Leicester City star was granted compassionate leave and traveled to Nigeria following the death of his beloved mother. The 26-year-old has not featured for Al-Nassr in their last eight games across all competitions, most recently against AGMG Olmaliq in the AFC Champions League.